bulletX is the next generation of lighting expendable evolution. 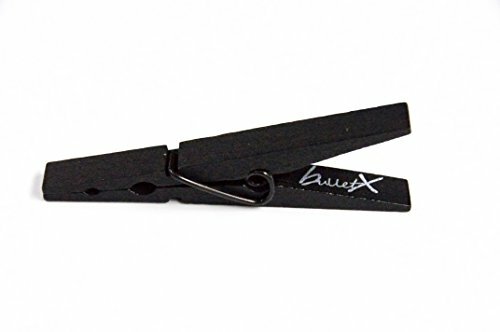 The entertainment industry adopted the standard household clothespin for lighting production use over 80 years ago. Industry professionals refer to it as “C47.” We use the “C47” on lighting fixtures on set, every day. However, since this product was not designed for the lighting industry, it must be modified daily to address the needs of lighting professionals. Converting a standard clothespin to a “C47 requires added time in a very fast paced environment! So why not have a product that is already manufactured to work correctly? Why has such an innovative industry tolerated an outdated product for so long? Introducing the bulletX! This long anticipated C-47 replacement will make your life on set so much easier. Why use old wood clothespins and binder clips on your lighting fixtures during behind the scenes shoots if you want to have the highest production appearance? The bulletX is "production black" to blend in! Why risk a "C47" releasing from the kino door during a shoot because the jaw opening is to small? The bulletX has a larger double notched 1" jaw opening and a stronger spring! Why use multiple types of clips? (clothespin, binder clips, small spring clamps and tape). The bulletX saves valuable time and replaces all of these items! Why struggle with hot scrims & burnt gel in fresnel lights? The bulletX has a tapered nose for small spaces! The bulletX is smart, simple, efficient, and it gets the job done right. What more can you ask for? bulletX is the next generation of lighting expendable evolution! This long anticipated C-47 replacement will make your life on set so much better! If you have any questions about this product by bulletX, contact us by completing and submitting the form below. If you are looking for a specif part number, please include it with your message.